5 stars We were very satisfied with the service from Tour by Locals and our guide Mimmo on our recent tour of Sicily. It exceeded our expectations and we will use this method again. We saw all the archaeological sites we wanted to visit and had the added bonus of a reliable, knowledgeable and fun person showing us Sicilian cuisine and culture. TOUR GUIDE RESPONSE: Thank you for your kind words and your pleasant personality!! Mimmo provided us with excellent service on our tour to Sambuca. It is a town in Sicily off the beaten path but was the birthplace of my husband's grandparents. Mimmo was outside our hotel in Palermo promptly. He gave us an informative and comprehensive tour of the town. It was exactly what we wanted! On the drive back to Palermo, Mimmo asked me if I liked bread. When I replied that it was my favorite food group, he proceeded take us to his local bakery and bought me bread! TOUR GUIDE RESPONSE: Grazie !! Mimmo is a great guide. We covered multiple cities during a six day trek: very knowledgeable, interesting, willing to adjust schedule to meet our needs, always on time, sometimes pretty funny and a great driver amid Sicily's winding roads and Palermo's hectic auto and cycle drivers. Most importantly, he was able to add a local flavor and antidotal flair which can only come from being immersed in the country and its culture. Nice job Mimmo! There were six adults in our group. Mimmo took us from Agrigento to the Villa Romana Del Casale at Piazza Armerina and back to the Valley of the Temples at Agrigento. It was a 10 hour day but so worthwhile. We all think it was the best day of our two weeks in Italy to date. Mimmo was totally professional, spoke perfect idiomatic English and was very knowledgeable. We got so much more from the day because of him. His 7 seater Mercedes felt brand new and was very comfortable. We thoroughly recommend him. TOUR GUIDE RESPONSE: Well, what can I say.. Thank you for the “Idiomatic English“!! Enjoy the remaining days in Sicily !! We spent six days with Mimmo, on a tour of Sicily. Every day was a treasure. Mimmo is an accomplished guide and an excellent driver. We admired his knowledge, his calm, his ability to solve problems, to make quick decisions. Mimmo adapted himself to our pace and he quickly learned about our interests. He always found ways to pleasantly surprise us. Thank you for a great Sicilean xperience. Mimmo gave us a fastastic tour. We were very grateful for his flexibility about adjusting our agreed upon schedule in a way that enabled us to incorporate into our plans a meeting with local relatives that we connected with after reserving the tour. Mimmo has a relaxed and engaging manner that will put any tourist at ease. He is knowledgeable, experienced and very willing to share his insights into Sicilian culture and politics. Our day with Mimmo was the highlight of our stay in Sicily. TOUR GUIDE RESPONSE: Thank you for your great review, feedback & generosity !!! Mimmo was a great guide taking us to the Roman Villa, introducing us to a wonderful restaurant in town, and then spending an hour or so with us at the end of the day at the Valley of the Temples. He was generously flexible with his time and was a wealth of knowledge at the 2 sites. A real pleasure - hope to do another tour with him one day. Highly recommend to families as well as just adult parties! TOUR GUIDE RESPONSE: Your pleasure is my pleasure. Grazie !!! We highly recommend Mimmo! He is professional, knowledgeable and has a great sense of humor. We travelled as a group of six who did Marsala tasting, salt flats and our favorite stop was Erice and lunch at a local restaurant and of course sweets tasting at the famous Maria Grammatico Bakery (yum). We had the best day with Mimmo and were sorry to see it come to an end. If you are visiting Trapani - Mimmo is a must! TOUR GUIDE RESPONSE: You were amazing people. It makes me want to see Australia !! Thank you for your great review and for drinking the wine at the winery, eat the typical food & the sweets in Erice. Mimmo was personable, professional, enthusiastic and knowledgeable. My wife and I recommend him without reservation. If we return to Sicily we would use him again and will recommend him to friends and family. A real gem!!! TOUR GUIDE RESPONSE: Grazie !!! This was, easily, the best tour I’ve ever had. Mimmo is an incredibly knowledgeable, articulate, attentive, interactive, intuitive and thoughtful guide. By the end of the six days together, I felt as though I had discovered the brother I never had. Thank you, Mimmo. TOUR GUIDE RESPONSE: Andy, it was a pleasure to tour Sicily with Ann & You. I always learn something from guests like you, who see Sicily also trough their eyes and other perspectives, and share their views and knowledge. Mimmo was an amazing tour guide. He was very knowledgeable and made our trip fun. He made us feel special and like we were part of his family and he took his time in making sure we had the best experience. The place he took us for lunch made it a special day and we love the time we spent with him. Overall it was a wonderful experience. One my family will always cherish. TOUR GUIDE RESPONSE: Elisa, it was a very nice day !! Thank you too for the friendliness of all your family. The typical lunch with the fresh local sardines wasn’t on the schedule, but I thought you would love it (and you did !!). TOUR GUIDE RESPONSE: Thank you for your feedback and I’ll be more than glad to show you the west of Sicily next time. Best for you and family. We had a great tour to Monreale and Cefalù with Mimo Salvo. Mimo picked us up at our hotel on time and we started our Sicilian adventure! Mimo was very informative, professional and entertaining on our tour. We highly recommend this tour with Mimo as your guide!! TOUR GUIDE RESPONSE: Thank you also for enjoying the traditional lunch at the Sicilian Village. Say hello to your family!! TOURSBYLOCALS RESPONSE: ToursByLocals is committed to 5-Star tour experiences and we appreciate any learning opportunity to improve the quality of the service we offer our customers. We take all feedback seriously and have, as always, attempted to clarify with our customer why this tour experience appears to have fallen below our guides’ normal high standards. Mimmo is the guide to have for custom touring in Sicily. Prompt, courteous, extremely knowledgeable and funny from my point of view. I booked a full day tour of Selinuite, Segesta and Erice. Covered all the bases plus lunch in a quaint, off the beaten path bakery/deli to sample some "authentic" Sicilian food with great cannolis. Highly recommend! TOUR GUIDE RESPONSE: Have a nice tour and thank you for eating the Arancini & Cannoli !! We spent a wonderful day with Mimmo in and around Trapani, Sicily. He was knowledgeable, courteous, professional and an excellent driver. He is also passionate about Sicilian food and took us to a great restaurant in Erice. All in all a great introduction to Sicily. TOUR GUIDE RESPONSE: Yes, it was a great day picking you up at the Cruise Terminal and show you the area around Trapani. Thank you for your pleasant company and rating !! We found Mimo to be very knowledgeable, helpful, friendly and flexible. He was willing to help us plan a trip based on our interested and schedule. We would highly recommend spending time with him to learn about Sicily. We found the tours to be a good value for our money. TOUR GUIDE RESPONSE: Thank you for being my guests for 5 days in Sicily. Help planing the tours is great in order to give you the best possible experience. All the best for the 2 of you. Mimmo is very friendly and knowledgeable about the historical sights we visited. I highly recommend him as a guide. TOUR GUIDE RESPONSE: Enjoy your journey in Sicily & Grazie Mille !! Extremely knowledgable, polite, good english speaking, big comfortable car and would not hesitate to recommend to anyone who wants to explore Sicily. TOUR GUIDE RESPONSE: Thank you for the friendly conversations and your kindness. Mimmo is the best! He customized a 4-day trip across Sicily for us in which we saw all the great Greek and Roman ruins. His historical and archeological knowledge is excellent. The real test however was wine and olive growers, as we do this ourselves. Our expectations were quite high, and he exceeded our expectations! Mimmo arranged some truly spectacular visits to organic wine and olive oil growers and producers. Molte grazie!! We will be back to Sicily & definitely seek Mimmo's guidance! Mimmo was the absolute perfect guide. He was knowledgeable and sensitive to our needs. I never mentioned to him that i have difficulty navigating due to a health condition. He noticed my husband helping me and i watched Mimmo adjust our route to be most accommodating. He was pleasant the entire day. I highly recommend anyone contemplating a guide for Sicily to let Mimmo show you his Sicily! It is a very enjoyable. We are grateful to him. TOUR GUIDE RESPONSE: Hi LaVerna - it was a very nice day with you driving trough the Madonie Mountains and the sicilian family style lunch. Hope you enjoyed tour birthday. All the best. Mimmo was absolutely fantastic! Knowledgeable, interesting and fun to be with. He went out of his way to help us figure some things out (not related to the tour) and made sure it was done to our satisfaction. Highly recommend him! TOUR GUIDE RESPONSE: You’re satisfaction is my satisfaction. I hope you enjoyed the rest of your journey in Sicily. Touring with Mimmo is a delight! He's bright, enthusiastic, very knowledgeable, and keenly interested in history and Sicilian culture. My husband and I spent the day with him from Piazza Armerina to Ortigia with a tour of the Syracuse archeologogical site and a walking tour of Ortigia. You won't be disappointed! TOUR GUIDE RESPONSE: It’s always a pleasure taking around people like you, open to suggestions and new food experiences.. Grazie !!! This tour might have been the highlight of the trip. Loved every moment Mimmo was absoulety the best! TOUR GUIDE RESPONSE: Thank you and enjoy the rest of your Honeymoon Cruise !! We had a spectacular day with Mimmo, touring Etna, lunch at an amazing winery and finishing in Taormina. Mimmo is friendly, considerate and knowledgeable. He is highly recommended. TOUR GUIDE RESPONSE: Thank you for being positive, friendly and laid-back. Have a wonderful cruise !! We have traveled extensively in Europe and have utilized many tour guides. Mimmo is by far the best of the best. We had the pleasure of spending numerous days with Mimmo throughout Sicily; and, by the end of our trip, we felt as though he was family. Just a few of his attributes: always on time, professional, knowledgeable, personable, fluent in English and easily understandable, and known to locals. He made our experience incredible! TOUR GUIDE RESPONSE: Touring Sicily for several days with you, from west to east, gave me the opportunity to show you My Sicily, and to make new friends. All the best for the both of you !! We had a wonderful afternoon with Mimo. I wanted to see my grandmother's home town and with Mimo's help, we not only got to see the town but also got to try some of the local specialties. I even was able to visit my great-grandfather's grave site. It was an amazing experience for me and one that I will never forget. Thank you for everything. TOUR GUIDE RESPONSE: Thank’s to you I make new experiences, too and visit places I’ve never been before. Mimmo was a wonderful guide. He is very knowledgable and has a great sense of humor. His love of Sicily is very evident and he told us many interesting stories about the archaeology, history, culture, and politics of Sicily. Our full day with him was delightful, and we highly recommend him as a guide. TOUR GUIDE RESPONSE: Thank you for your feedback. Mimmo is an excellent guide with great knowledge of Palermo and its history. More importantly he has a phenomenal sense of humor which makes the tour that much better and enjoyable. The walking portion takes you through the unbeaten path which allows you to discover another part of the city and experience its taste and character. 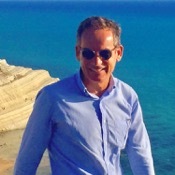 I highly recommend Mimmo and am happy to hear he offers tours across Sicily, including a complete island tour. What a great day he made us have! TOUR GUIDE RESPONSE: Thank You for your opinion and having a wonderful day, all feeling comfortable spending the time together in Palermo, enjoying the sights, lunch break and gelato. It’s such a great pleasure to have people like you to take around. Mimmo is a wonderful tour guide. He is professional, knowledgeable and so pleasant. We were very comfortable traveling the day with him. We visited Trapani and the surrounding areas. He is clearly well liked by the locals who are happy to work with him. I highly recommend him as an excellent guide! I only regret we only had time for one tour. As I travel to Sicily often, I definitely look forward to booking with him again. Thank you Mimmo! TOUR GUIDE RESPONSE: Hello Judith, I’m so pleased about your feedback. I’ll be more than happy to show you other areas of Sicily. Thank you !! Mimmo is an excellent guide and gave us a very good and concise history of Selinunte. This helped put everything into context far better than reading it in a guide book. We had a very enjoyable tour of the temples both of Selinunte and Segestra the following day. Having the same guide for both meant we did not cover the same ground twice but looked at different aspects or similarities between the two sites. Mimmo also made some excellent recommendations for restaurants. TOUR GUIDE RESPONSE: Your interest, attention and friendly attitude made it so pleasant to unfold the history of the places we visited. Grazie !! TOUR GUIDE RESPONSE: Thank you. Mimmio was great. Very knowledgable and interesting. We spent the day with him touring Segesta and Erice but wouldn't hestitate to recommend him to anyone who wants a multi day tour of Sicily. I have used tours by locals many times and he was definitely one of the best. He is also a good driver( helps in Sicily). thanks mimmeo. TOUR GUIDE RESPONSE: Grazie Mille !!! Our tip was wonderful! Mimmo did an outstanding job not only with the history of Sicily but also their culture. He is very personable and definitely has a cool factor about him. Unmistakably Sicilian. TOUR GUIDE RESPONSE: Natalie - it was such a pleasure to show you as much as possible during the 5 days we toured Sicily together with your family. All the best for you all !! Mimmo did a wonderful job. We made the decision to shorten the tour and he still made sure we saw most of the things that we had on the original tour. Very easy to understand and very knowledgeable about the area. TOUR GUIDE RESPONSE: Thank you for your sympathy and the wit of your party. All the best to you all. Good day with Mimmo. Mimmo was very flexible in our tour when our port changed at the last minute. We enjoyed visiting Mt Etna, the winery was outstanding, and lunch was very good although unfortunately his 1st choice wasn't open. We had a little confusion meeting in the morning but worked through that. Mimmo didn't provide too much commentary and didn't seem comfortable. Given the other TBL tours we did, this one seemed a little overpriced to us but a good day with wonderful memories. TOUR GUIDE RESPONSE: I understand it was not the perfect tour, but at least you enjoyed Mt. Etna and the outstanding winery I choose for you. Even lunch was very good (I'm sorry my 1st choice was closed on that day). Well, yes, we didn't meet right away (but 5 min later) due to the fact that 2 big cruise ships arrived that day in Messina. All the best for your future trips. Mimmo was very knowledgeable, providing commentary along the entirety of the walk through the city. He had many facts about various sights along the way in addition to the big attractions we visited. Also, he took us to two different markets in the city, showing us the popular local food. In the short time we were touring, we felt that we learned a lot about the rich history of Palermo. Overall, it was a very enjoyable tour through Palermo. TOUR GUIDE RESPONSE: Thank you ! Mimmo was a great tour guide. He made our trip to Cefalu one that we will always cherish. He was knowledgeable and personable. I would recommend Mimmo to anyone thinking of using a personal tour guide and would highly recommend Tours by Locals. We were lucky to have Mimmo show us Palermo and the Agrigento temples on two different days. Mimmo seems to know everything about the places we visited with him: the history, geography, architecture, and any number of fascinating facts and anecdotes. He's never at a loss with answers to our questions. He was unfailingly courteous and considerate with us, accommodating various schedule glitches (our fault) with resourcefulness and great good cheer. Mimmo provided us with a full-day customized tour of the Taormina area. Our group of 4 adults, with gear, thoroughly enjoyed the day in his comfortable car. Mimmo shared his extensive knowledge of Sicily society, culture, and history with us, and answered our many questions. He showed us some amazing sights and explained them to us. We were 110% satisfied with Mimmo, and will be recommending him to friends and family visiting Sicily. We only wish we would have had more days to tour with him. TOUR GUIDE RESPONSE: Thank you for your feedback and rating. I hope you're happy with the pictures you took specially those of Mt. Etna in full activity. I'll be more than glad to show Sicily to your friends and family. Very knowledgeable, and very accommodating. Mimmo changed the content somewhat on the fly, very nice. Mimmo is extremely knowledgable and accommodating. He planned a perfect and enjoyable day for us, was very flexible, personable and interesting. He is highly recommended. Our tour with Mimmo was on October 19, 2016, Segeste, Erice and Salt Pans. We rated this tour on 5/5 but it was much more, maybe 10/5! Mimmo was a perfect guide for us to learn a lot, enjoy his vast knowledge and discover a new friend.It was the best guided tour we had during this trip. We warmly recommend Mimmo for any guided tour all across Sicily. TOUR GUIDE RESPONSE: 10/5..WOW !!! Thank you very much for being such generous persons. Your pleasure is my pleasure. Mimmo is excellent, knowledgeable, friendly and fun. Highly recommended! Our tour with Mimmo was both highly informative and fun. Mimmo's command of English is excellent so he was able to clearly explain the history of the area and its many sites. There were 4 of us on our tour and each of us felt that we were very lucky to have Mimmo as our guide. Mimmo was the best tour guide we have experienced. He is very knowledgeable and personable. He gives insights of the history of the country and the current government policies that shape the country. Our tour was the most informative and enjoyable experience on our tour of Sicily and Italy. In fact, the Sicily tour was the highlight of the trip. I highly recommend Mimmo. Our group was very pleased with the tour of Agrigento conducted by Mimmo; he spent a lot of time providing all the important historical & archelogical details of the site which greatly enhanced our appreciation of what we were seeing. Mimmo was also very personable as well which is important when you spend so much time together. Mimi provided a great walking tour of Palewrmo making sure we visited all of the key areas of the city and then proceeded to provided amazing details regarding the historical background of Monreale and the amazing Churh in a cave at Mt. Pelegrino. A great day out exploring the Tripani region. Our tour guide Mimmo was excellent and so knowledgeable about the local area. The scenic tour was stunning and the Pellegrino winery in Marsala which Mimmo took us to was fascinating. The best part of the day was Erice with its tiny cobbled streets and its air of medieval mystery. I particularly loved the 40 year old sweet shop. A huge thank you goes to Mimmo for making our day so interesting and also giving us insight in to Sicilian life and culture. TOUR GUIDE RESPONSE: Thanks for being here in Sicily and enjoying the day. Mimmo was very knowledgable and engaging - even with two children under 10 in our group - patiently answering their questions and expanding on their interest even if it had nothing to do with the tour (pine cones?!). He also went out of his way to help us find the meeting place and provide general information on touring Sicily and other sites. Very highly recommended. Would definitely book other tours with him. TOUR GUIDE RESPONSE: Lisa, I hope you 2 and the girls, had a great time in Sicily. Thank you. TOUR GUIDE RESPONSE: Experiences with people like You mould my life. Thank You. If your planning a trip to Sicily you have to go to Savoca and Taormina. I highly recommend booking with Mimmo. We had a great time with him as our guide. He took us to the most breath taking locations for photos. Taormina was our favorite place in Italy. TOUR GUIDE RESPONSE: It’s easy when you have enjoyable people like you ! Grazie. My husband, myself and 7 members of his family visited Sicily recently. We wished to trace his roots and see Alcemo and Palermo, but had no real itinerary. Mimmo was infinitely patient in somehow managing to get nine people of varying ages to come up with a plan. He offered a variety of ways to transport all of us and met each change of plan with patience and efficiency. Result: 3 days of reminiscing and good food and wine together with seeing wonderful areas we wouldn't have dreamed of without him! TOUR GUIDE RESPONSE: June, Andy and the rest of family members (including wonderful ladies from Australia and other parts of the world, wish you all the best. Thank You. Mimmo -is a pleasure to spend your time with Knowledgeable, kind, peaceful, a great pathfinder. We put our trust in Mimmo, and he over delivered. He knows, history, gelato, architecture, super fine cuisine, and all at a pace that is artful as it is dis-arming. This guy is good! TOUR GUIDE RESPONSE: Well, sounds like you enjoyed the 360° tour in Sicily. Mimmo was an outstanding guide. He knew a great deal about the archeological history of Noto, Ortigia, and Siracusa. He took us to a wonderful luncheon place where locals eat. He had a very pleasing personalty and was very patient. We would recommend him and this tour highly. TOUR GUIDE RESPONSE: Only because it was your birthday… Another 100 of these !! Thanks to you. This was an excellent introduction to Sicily, both to the site st Segesta and the city of Trapani. Mimmo explained the history of the area, what we know and what we may not know, and gave us an insight into the people's who have lived here. We especially loved his suggestion for lunch -- typical Sicilian food served at the Segesta site's cafeteria. An unexpected location for wonderful food! Loved his passion for history and ability to keep your attention. Hope to see him again on a future trip! TOUR GUIDE RESPONSE: Everything worked out well at the end. Nice working with you. Ciao. Mimmo is a fantastic guide. He is 100% reliable and everything you want with a great guide. His knowledge and information about Sicily is endless, conversations are informative, lively and always very interesting. He speaks perfect English and is extremely easy to be with. He has his own very nice car and is an excellent driver. Mimmo guides throughout Sicily and he will customize your program specially for you. He can also guide large groups and will organize bus or van transportation as needed. Mimmo did a wonderful job on our "Roots Tour in Sicily" for our family of 8 people.. He was prompt, patient and polite. He was especially patient with my elderly parents, who needed mobility assistance. It was a wonderful and memorable day, thanks to Mimmo. I would recommend him without hesitation for a wonderful Sicilian Tour. Thank you, Mimmo!! The best tour we had during the entire trip. Mimmo made this trip for us so memorable. He is very educated and knows his history. We felt very comfortable as if we had known him previously. I can't say enough good about Mimmo and I am so glad I picked him for our guide. In the future if I have a chance to use this company again it will always be Mimmo. Mimo did a great job! I would book with him again if I ever get back to Sicily. Mimmo is without a doubt the best guide out there! He is knowledgeable and understands the client and the need for them to take away great memories from Sicily. I would highly recommend him for a tour to anywhere on Sicily! Mimmo showed us sights on Sicily that I never thought I would see in my lifetime. His knowledge of the area and sensitivity to our needs (two of us were older) was wonderful. In addition, his pride in his home island was heartwarming. I hope to be able to visit Sicily again and, if that happens, you can be sure I will be booking another tour with Mimmo. This was a very nice experience that was personalized for us. The tour guide was attentive, knowledgeable, flexible, and had a great sense of humor. We enjoyed the tour and the gelato that ended it all! Thank you. We had a terrific tour with Mimmo today. His knowledge, passion and explanations of Palermo and Sicily were fascinating and we wish we had more time to spend with him to get to know this wonderful island. First we walked around Palermo, getting a very clear overview of the sights and history; in the afternoon we went to Cefalu. The only draw-back was that the church with the famous mosaics was closed-therefore only 4 stars! BUT: we'll be back next year with Mimmo! TOUR GUIDE RESPONSE: I’m happy to know you enjoyed your day in Sicily. It was a pleasure for me, too. Unfortunately, churches in Italy, and in Cefalù as well, in the afternoon very often are closed, sorry ! We had a wonderful time in Cefalu with Mimmo. He's an excellent guide and we would highly recommend him. TOUR GUIDE RESPONSE: Andy, thank you, but I won’t raise my fee.. Your satisfaction is my pleasure. Say hello to Liz and the others. My intention for visiting Corleone, Sicily was not to take a standard tour. It was to experience, in the very short time of one day, a little of the life of my great-grandparents who immigrated to America. I also wanted to do a little genealogy research to determine if my great-grandfather, my bisnonno, had any siblings. I had a hand full of wishes on my "bucket list" that was not going to be satisfied by a standard tour. Mimmo checked off every item in my list! Multu Grazii! TOUR GUIDE RESPONSE: I'm so glad the experience in Sicily fulfilled your hopes. Wish you the best. Thank you. We had a perfect tour mixing historical Polermo with the reality of modern day life in the city with refreshing candor covering each. Mimmo is very knowledgeable and engaging. We liked him so much, we invited him out to lunch afterwards. MIMMO was your total professional, extremely knowledgeable, very pleasant and always courteous. We were in very good hands and very pleased with the tours he chose; Segesta and Monreale. At the end of our short time available, Mimmo added a mini tour of Palermo's highlights, which was an unexpected bonus. The Murphys, Cheresnicks and Coughlins. Mimmo is very knowledgable and engaging. Excellent guide and extremely helpful. Mimmo was vastly knowledgeable about the temples of Agrigento and provided us with a comprehensive history of the area and Sicily in general in a short amount of time without ever making us feel rushed. Mimmo was also very understanding and helpful to the challenges of travelling with an elderly mother and infant child. It was a pleasure to meet Mimmo. He was very charming and friendly and I would definitely ask him to guide us again. HIGHLY RECOMMENDED! We truly enjoyed our tour with Mimmo. He had some very interesting and often philosophical stories to tell. Mimmo was the perfect guide with the right combination of local stories, and history of the area. He was especially good at meeting the variety of needs of the individuals in our group. We appreciated his flexibility and his ability to execute the itinerary which we had agreed on. Everything went smoothly thanks to his great guiding skills. Our tour to Erice and the west coast was our second tour with Mimmo. I can only repeat my praise of him as a guide. In addition to his wonderful knowledge, he also has a great sense of humour. I could not ask for anything more. Wonderful experiences all round. Mimmo is a wonderful guide. He is brimming with information, historical and current.Arigento is a great spot to visit. Mimmo made our days absolutely memorable. LEAVE THE CITY BEHIND Spend a great day visiting Cefalu and Castelbuono. Mimmo was an excellent guide and the day was run very well. This is a really lovely way to spend your day out of Palermo to see the real Sicily and taste some great food. Great value. We were on a family trip to Sicily to see our family hometown. Our tour guide Mimmo was fabulous and I highly recommend him. He picked us up on time and gave a great tour of getting to the town. Mimmo is very friendly and his knowledge and great tour was impeccable. His recommendation for our Easter dinner was fabulous, we are still talking about it......Can't wait to come back!! I took three tours with Mimmo. A walking Palermo tour, a vineyard tour and an archaeological tour. All were terrific. Smart, funny, timely and very personable, Mimmo made my trip to Sicily very memorable. A trip with Mimmo is a trip you won't forget. He's great. I am a frequent traveller and this is the first time I hire a private guide. The experience was fantastic, Mimmo is a charming and educated person with a huge knowledge of history. Visiting Palermo, Erice and Segesta together was great. I learnt and have fun at the same time. I deeply enjoyed it. By the way I highly recommend to spend time in the west area of Sicily. I found it much more interesting and beautiful than the more known east area. TOUR GUIDE RESPONSE: I'm really happy for you to consider the tour a highlight of your vacation. It was a pleasure to take you around and to your roots in Sicily. Thank you for all. Mimmo. We were a big group and so we wanted a private tour with a bus and driver to take us around Sicily to the main sights. Domenico arranged everything for us splendidly and was helpful in making decisions to maximize our time. He was our guide at times and at others arranged for another local guide to give us the tours. His restaurant recommendations were all excellent bets as well. Mimmo arrived in a nice clean car, which was large for Sicily. Plus a good driver! His English was great, he had great knowledge of the sights. He was friendly, and easy to talk to about his island, the culture. We asked to stop for cappuccino, he located a great quick place to start our morning. A great wine shop later where we had lunch, wine & olive oil tasting. The sights were just incredible, again giving us so much more information then we could get by a guidebook. Plus a bonus stop by the sea. TOUR GUIDE RESPONSE: It was a pleasure to show you some of the great heritages we've got on the Island. Having "on board" such interesting persons it comes natural to involve them with the different topics. Thank you very much for enjoying the tour and..the cappuccino.